Unlike the past, the new generation people have the most popular and convenient way to share the news using social media. Sign up for newsletters to receive more information about the causes and get to know more about it. Sharing your SEPSIS story or any other victim you know helps and motivates others to fight against it. Enroll yourself as a volunteer to help people with SEPSIS and share the information on Facebook or Twitter and let others know. SEPSIS awareness month is an exceptional occasion to raise awareness and to make people know about it. Sepsis Awareness Month is an excellent opportunity to have a discussion with your family members, colleagues, and friends. Explain the importance of getting diagnosed at least once a year. Black and Red are the awareness colors for SEPSIS. Wear anything with this color will help you create awareness for this. Some ideas include black ties, shoes, scarves, sunglasses, red bracelets, hair bows, finger rings, LED bands and more on. Also, decorating your office desk or the entrance of your house with awareness color balloons helps you to promote the need for getting diagnosed often. Using customized wristbands are a great way to spread the message. 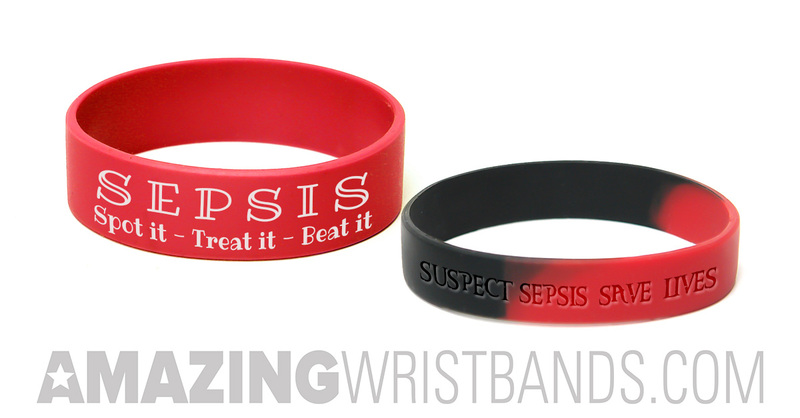 Imprint your bracelets with messages such as “Sepsis – I’m aware”, “September - Sepsis” or “Say Sepsis, save lives” They can also be imprinted with an awareness ribbon. Here, you get high quality 100% latex-free silicone products. Our products are highly comfortable, durable, long-lasting and are available at very affordable prices. We have a variety of colors, fonts, sizes and styles such as debossed, ink filled debossed, embossed, color-filled emboss, and screen printed. In addition to standard wristbands, we also have thin, wide, extra wide, slap bands, adjustable bands, LED wristbands, Medallions, key rings, finger rings, and USB flash drive bracelets. Our 24x7 professionally qualified and friendly, customer-oriented staff will help you design your wristbands exactly the way you need them.